The mid-term elections are just a few weeks away, and I think most, if not all of us, are interested in the outcomes of the many federal and state elections. Some might be interested in learning if Georgia and/or Florida voters will elect their first African-American governors. Others might be wondering if the results of the mid-terms will shift the balance of political power in the U.S. Congress. I am interested in both, but there is something else about this year’s mid-terms that has my eyebrows raised: the role of the public educators in many of these elections. This year has been one filled with state and local teacher strikes. 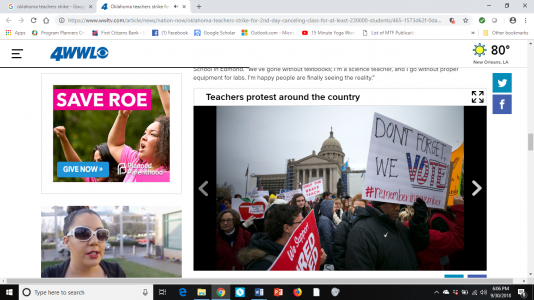 As I have written in a previous PA Times article, West Virginia teachers went on strike for almost two weeks last February and March. This strike effectively shut down the state’s education system until Governor James Justice signed a bill into law providing a 5 percent salary increase. Since then, teachers in Arizona, Colorado and Oklahoma have also held either county-level or statewide strikes. All of these strikes have ended with the teachers generally winning acceptable concessions for increases in salary and/or public school funding. To date, there are two other teacher strikes that have not been resolved (the strikes are over but the issues that led to the strikes still remain) – one in Kentucky, the other in North Carolina. Historically, state and national unions such as the American Federation of Teachers (AFT) and the National Education Association (NEA) have been the most powerful allies for teachers. Paul Manna’s “Collision Course: Federal Education Policy Meets State and Local Realities” highlights their ally roles, describing in his book how both labor unions had significant responses to No Child Left Behind and the Elementary and Secondary Education Act to protect the interests of its teacher members. While the AFT and the NEA continue to be engaged with the current teacher strikes, it’s the actions of the teachers themselves that are impressive. Many of them have decided that instead of fully relying upon their unions or legislatures, they have chosen instead to take matters in their own hands. While Oklahoma’s strike ended favorably for teachers, some Oklahoma politicians were not so fortunate. Eight of the 19 Oklahoma state representatives who opposed a bill increasing teacher pay were defeated in the state primaries. Four of those 19 representatives decided not to run for office. In addition, several dozen teachers in Oklahoma filed for candidacy at both the state and local level. 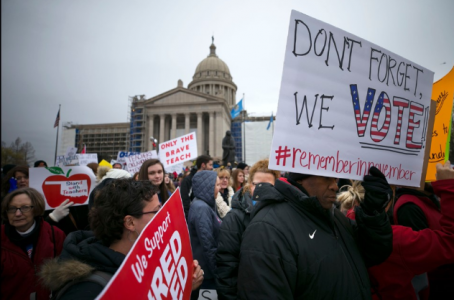 This political engagement though is not exclusive to Oklahoma. The NEA reports that over 500 educators nationwide are running for office this year, including positions such as governor, lieutenant governor, state senator, state representative, state auditor and state land commissioner. There have been some early successes with these teachers who are running for office this year. R. Travis Brenda, a high school math teacher in rural Kentucky, defeated Jonathan Shell in the Republican primary for the 71st House District. Shell had been in office since 2012 and is the current House Majority Floor Leader. This was Brenda’s first run for political office. Many believe that Brenda’s primary win was a direct result of voter frustration with a pension bill passed by the state legislature which negatively affected teachers. Regardless of how anyone feels about them, this year’s teacher strikes have the potential to have a long-term impact. For example, there are many other public service professions that have issues similar to teachers related to pay and benefits. Will we see similar strikes by others in public service in the future? Will we see more political activism in the form of “lay” public service candidates for office? And what about those currently in office? Clearly, state and federal elected officials are paying attention to this teacher movement of 2018. At the very least, they all know that their votes on key pieces of legislation directly affecting teachers will be highly scrutinized. Whether they participated in strikes or not, it seems teachers across the country have successfully channeled their frustrations into empowerment. Teachers and teachers’ unions have, in the past, tended to be viewed as Democratic-leaning. Could this empowerment change the political landscape for teachers? Perhaps issues that cross party lines are the ones that will ultimately bring about better pay and benefits for teachers, and better overall education funding for state and local jurisdictions. Then again, I could be looking at the world through idealistic rose-colored glasses and really hope for some big wins for our nation’s teachers. I guess my eyebrows will remain raised on this until we get the results from the November 6 elections. Author: Carmen Ashley is a doctoral student at Valdosta State University and is also a federal employee who appreciates those who have a commitment to public service. Her email is [email protected], and her Twitter handle is @CarmenLAshley.